The bizarre sport of motorcycle football was first witnessed in the 1920s and it was during this decade that it experienced the bulk of its popularity. 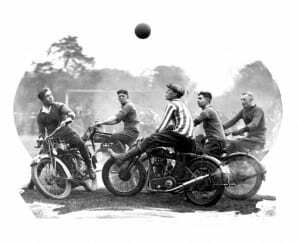 The premise of the game was identical to that of its non-motorised counterpart, though motorcycle football saw two teams of six riders battle it out instead of two teams of 11 – one can only imagine the utter carnage that would ensue should 22 motorcycles take to the field at once! Here we see Gordon Sharratt of West Bromwich MCC (striped jersey) making a save in West Brom’s match against Wolverhampton MCC in May 1928.